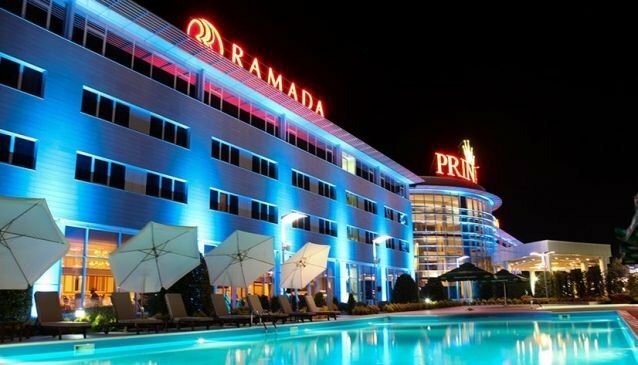 Ramada Plaza Gevgelija, the luxurious 5-star hotel, situated near the Macedonian - Greek border, features a grandiose Princess Casino, spa center, indoor and outdoor swimming pool and conference center. Located 70 km from Thessaloniki and 160 km from Skopje, the hotel is easily accessible by car. Ramada Plaza Hotel is perfect for both business and pleasure and with its spacious event halls it is also a great place for parties, anniversaries and weddings. The Casino features 515 slot machines, 4 electronic roulette machines, 24 live game tables, 8 Texas Hold'em Poker tables, VIP area, a dining restaurant with mouthwatering daily buffet and exclusive bar.